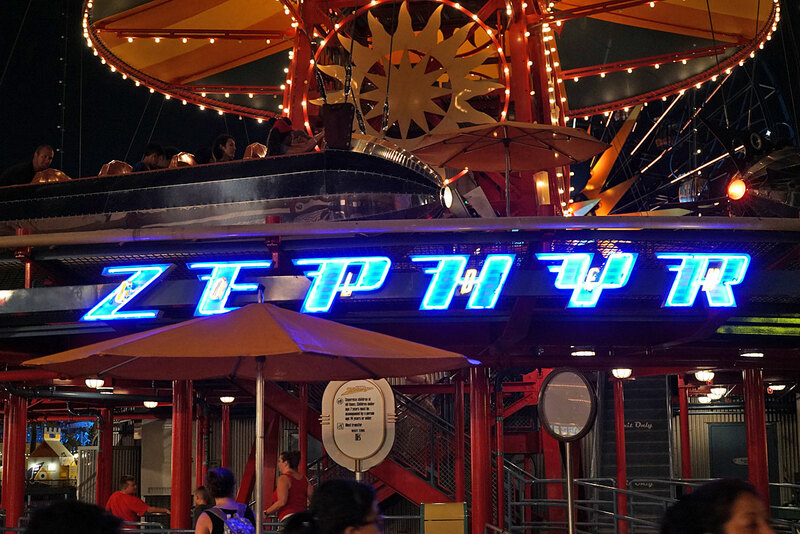 The Golden Zephyr is located in Paradise Gardens Park at DCA. 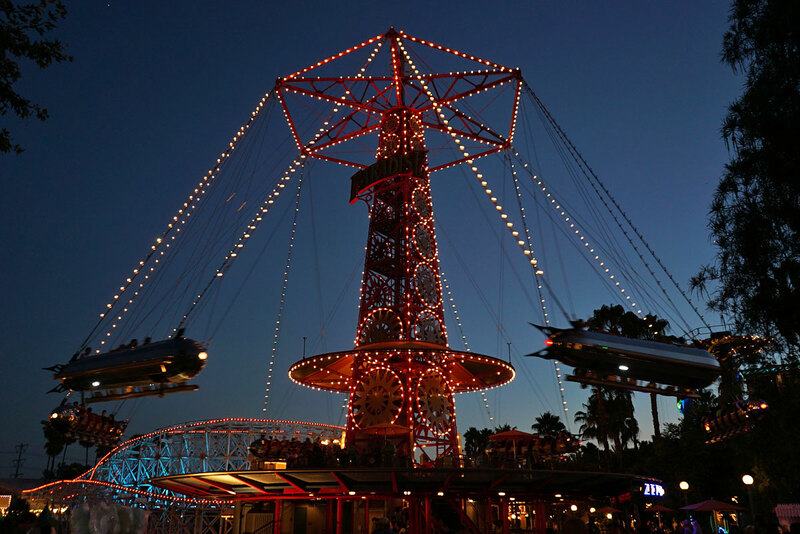 This retro attraction gives guests the chance to soar high in the sky in a gleaming silver spaceship inspired by the science fiction stories of the 1920s. This type of attraction, known as the Circle Swing, was a standard fixture of many popular boardwalk parks of the 1920s through the 1940s. The ride represents a past vision of the future reminiscent of the old serial films like Buck Rogers. At about 90 seconds, the ride is short but sweet, and gives riders a great view of Paradise Gardens and Pixar Pier. 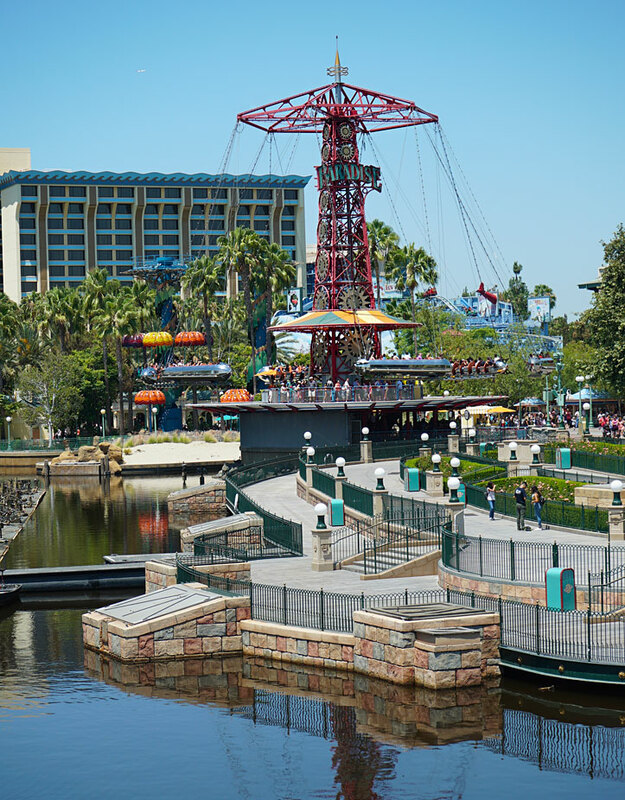 Originally part of the Paradise Pier land, the refurbishment of the area split the land in two. 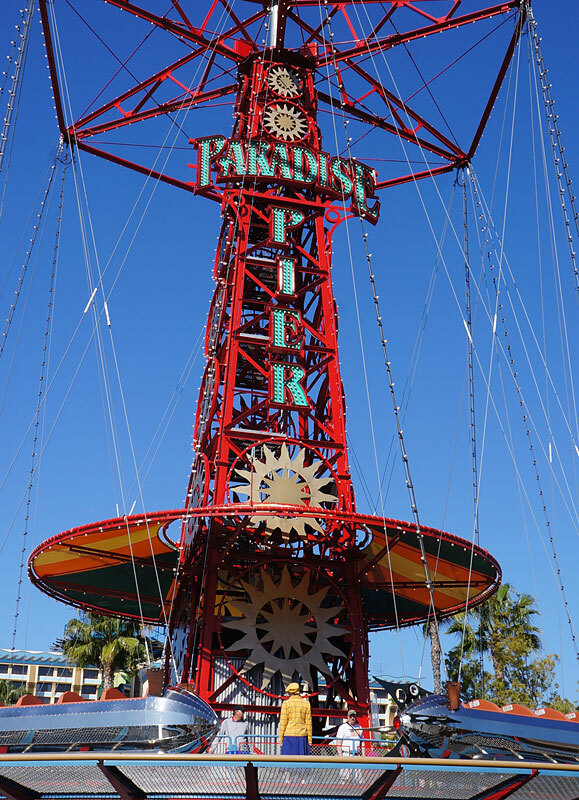 So now the land that is home to the Golden Zephyr is Paradise Gardens Park, which resulted in the removal of the Paradise Pier lettering across the top of the ride. It now simply reads "Paradise". Each vehicle is fit with quadruple stabilizer fins, gold and chrome trim, running lights and underbelly strobes. In the background, you can see the Disney's Grand Californian Hotel. Nighttime is a great time to ride, especially when it's so colorfully lit. Truly is a beautiful ride (and a nice name). 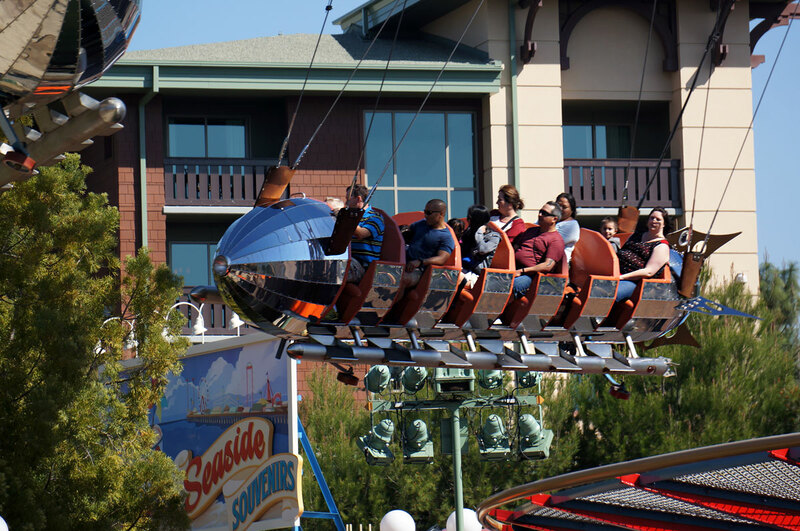 I've always liked these 'Air Ship' rides ever since I saw the old film footage of Coney Island many years ago. It's nice to see that Disney (and a few other parks) have brought it back. 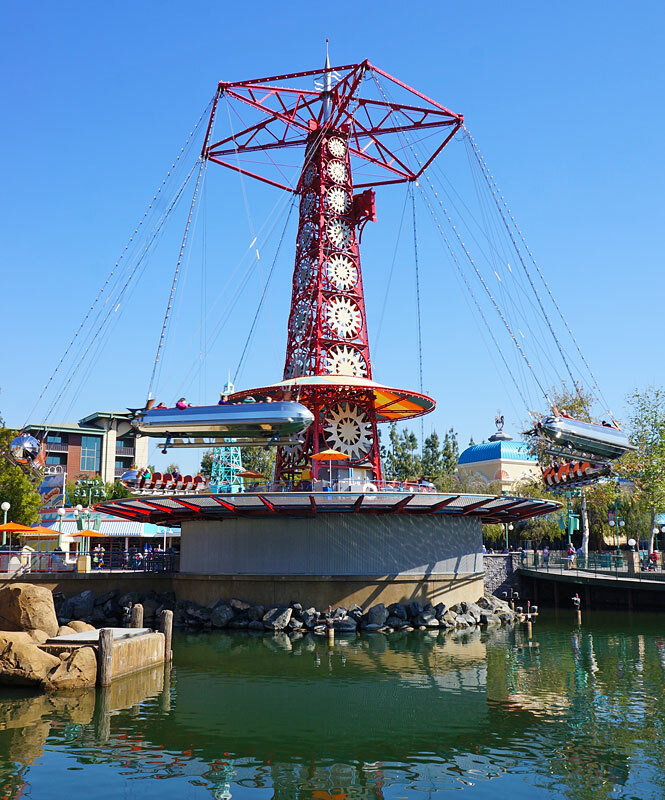 Seems like they could have speeded it up a bit to make it swing outward more; make it more of a thrill ride. But I guess they wanted it to be a family ride, not a thrill ride. 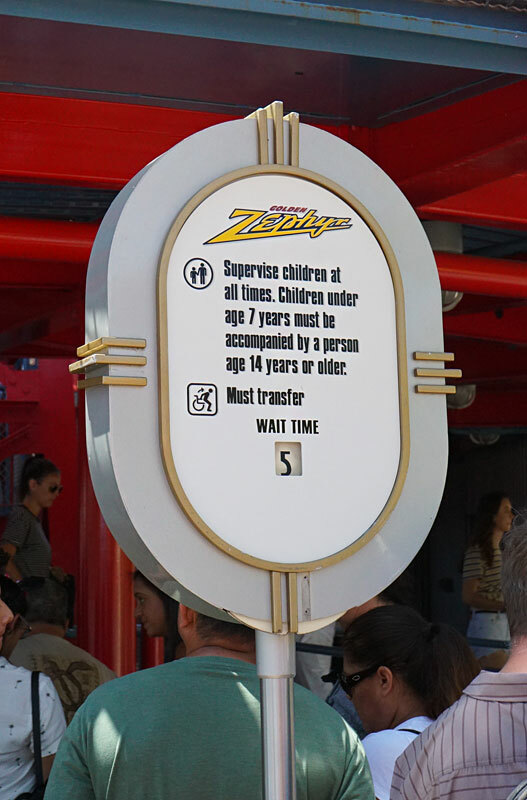 Even Disney's thrill rides (Matterhorn, Thunder Mountain, etc.) are rather tame by amusement park standards. Haven't been following the PP transformation too closely, was disappointed they were going away from the original concept. Nice to see this ride sticking around as well as some semblance of a vintage theme. Honestly, the Pixar Pier transformation made only minor changes to the whole look of the land. Although I haven't thoroughly explored the new land, I'd have to say they've made some nice improvements without ruining the original atmosphere. I think this attraction is cool. It is something I would ride if I ever make it to Disneyland. 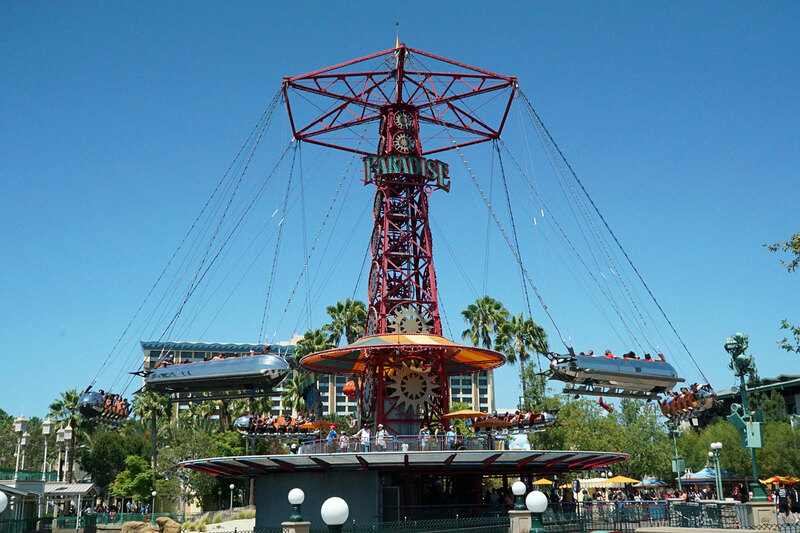 I like some of the different flat rides they have because it adds more energy to an area. 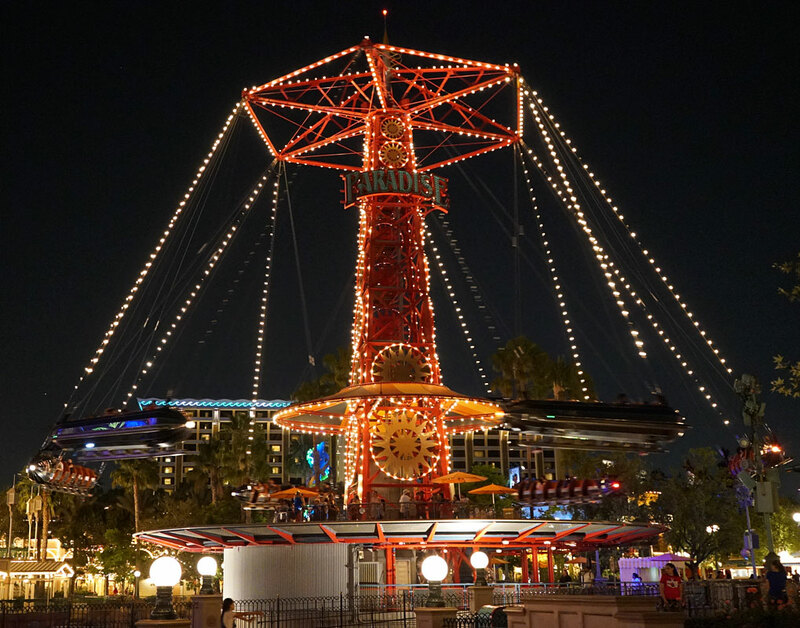 Pixar Pier is a cool concept, but sometimes I wish some things would be different. Like I said, I have not been to Disneyland, but I have watched many videos and looked at many photos to get a feeling for everything. I love the photos and love these posts. I love this ride, and this part of the park.